sample image 2CV old, radiator grill, fly-screen behind the radiator grill. Suitable for Citroen 2CV, of year of construction 1963 to 1969. First version after the corrugated sheet hood. For radiator grill from aluminum with large Chevron (No. 16096). 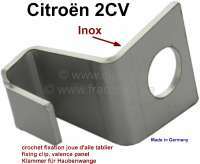 sample image 2CV, Valence panel on the left for Citroen 2CV. (attached sheet metal between fender and bonnet). Good reproduction from the European Union. 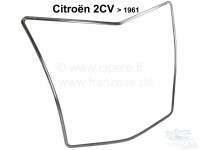 sample image Valence panel on the right for Citroen 2CV. (attached sheet metal between fenders and bonnet). Good reproduction from the European Union. sample image 2CV, Valence panel, rubber seal between Valence panel and a-post (front wall). Suitable for Citroen 2CV starting from year of construction 1961. Made in France. sample image 2CV, Valence panel, fixing clip from high-grade steel, for the securement of the Valence panel at the front wall. Suitable for Citroen 2CV. Or.Nr. AZ 85280A. Made in Germany. 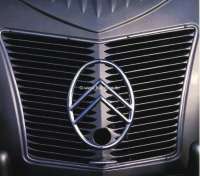 sample image 2CV, Radiator grill from aluminum, Design 3 bar. Suitable for Citroen 2CV starting from year of construction 1961. This radiator grill is installed from 1967 to 9/1974. It is a good reproduction. The material is heavier and the center web is from rubber. sample image Radiator grill from aluminum, Design 3 bar. Suitable for Citroen 2CV starting from year of construction 1961. This radiator grill is installed from 1967 to 9/1974. It is a reproduction, with hard plastic at the center web. sample image 2CV, Radiator grill from synthetic, color grey, with chromed verge. Suitable for Citroen 2CV. This radiator grill is installed in some Charleston models. sample image 2CV, Radiator grill from synthetic (original), color grey, with black frame. Suitable for Citroen 2CV. Original Citroen, no reproduction! sample image 2CV, Radiator grill from synthetic (original), color grey, with chromed frame. Suitable for Citroen 2CV. Original Citroen, no reproduction! sample image 2CV, Radiator grill from synthetic, color grey, with grey verge. Suitable for Citroen 2CV starting from 1961. Installed one starting from 1973.
sample image 2CV, Radiator grill from synthetic, color grey, with black verge. Suitable for Citroen 2CV. This radiator grill is installed in some Charleston models. sample image 2CV, Radiator grill from synthetic. Completely black. Simple reproduction. 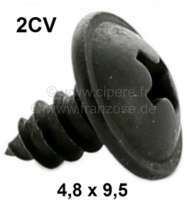 Suitable for Citroen 2CV starting from 1961.
sample image Sheet metal driving screw with large head. Black galvanizes. Measurements: 4.8 x 9.5 mm. Suitable for radiator grill 16002.